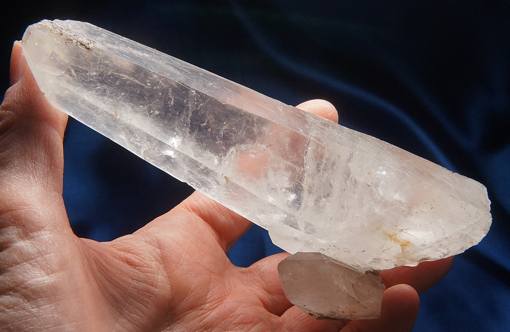 This is an 8 oz, 5.55" by 2.25” by 1.05” matte finish quartz wand from Brazil with light cathedraling, a healed base and side students. He is ever so slightly smoky with a vertical silver shield in his termination and areas of manganese in the crevices! His sides show very nice Pleiadian glyphs, highlighted by his light-gathering mists. He is positively radiant and brilliant and an amazing handful of energy. There are some very tiny dings, but nothing of any significance at all! I love the way this Spirit fills with light! It’s as if he gathers all the energy in the room and focuses it into an immense beam of light – I swear you can use him to see in the dark! He would love to work with a crystal healer or Reiki practitioner where he can be used for “psychic surgery”, deftly carving out energy blockages, implants from past lives and negative energy pockets. Whether we realize it or now, our aura is a blueprint of our physical, emotional and Spiritual health. Disease at all levels show here and can be treated here as well. It is important to note that as with conventional medicine, this is simply treating the symptom, but it gives the body a jump-start so that the root cause can be addressed. This Spirit is an important tool for setting the stage and accelerating the true healing to follow. These wands were used in Atlantis and Lemuria and highly sought-after ones at that! Although they were abused in that period, they are appearing once again, but with modifications so that they are never used with that intent again. Their role now is primarily healing. He is an astounding and capable helper and will be a true blessing to his Keeper.